Check this box to Add Printing Charges @ Rs. 18 per Sq. 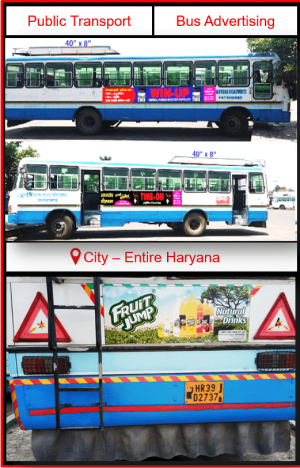 Ft.
Haryana Roadways Buses Advertisement Campaign is now worth reliable and suitable to build a Huge Brand recall and recognization among the massive audience. Advertising on Haryana Roadways buses provides an extensive reach covering the entire Haryana & provide the exposure to the highly crowded areas of the cities ensuring Huge Brand Recall & Great ROI. Driver Panel: 16 ft. x 1.5 ft. 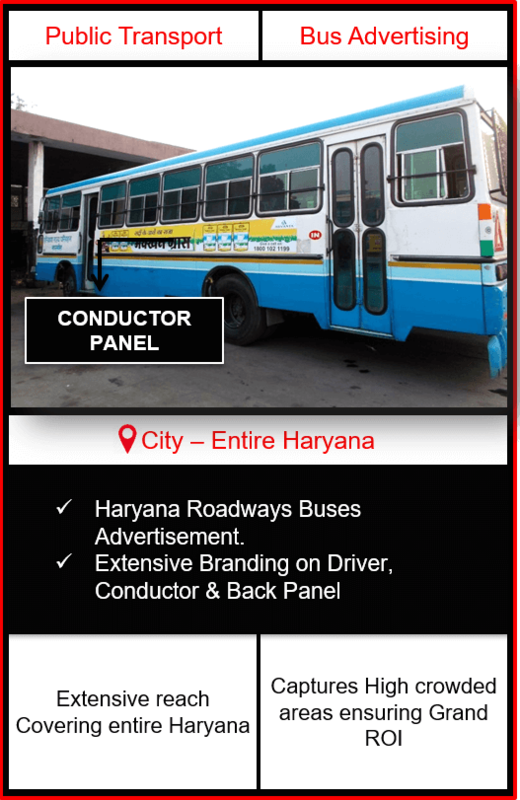 Conductor Panel: 16 ft. x 1.5 ft.
Back Panel: 4 ft. x 1.5 ft.
* The client has to choose the depots where the buses belong to. The complete & exact list of depots with their routes would be shared at the time of booking. 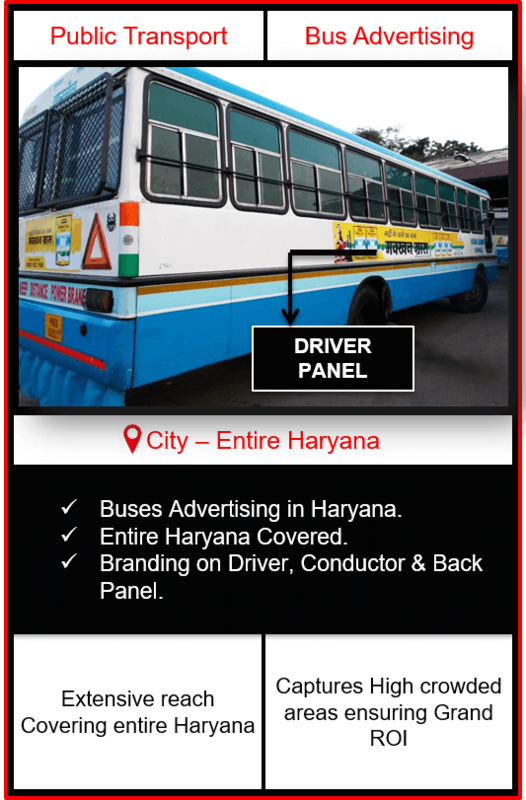 The client can then choose the number of buses in the selected depots. 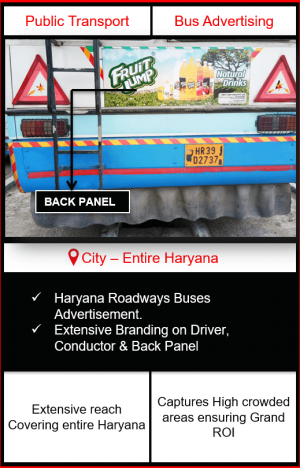 Branded buses images will be shared prior to Campaign startup. The Images with complete information i.e. 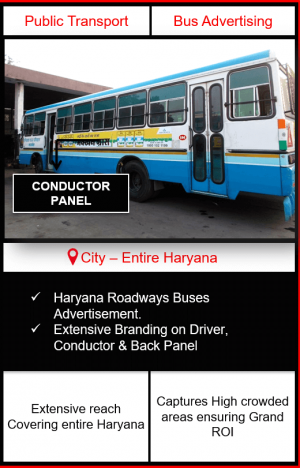 Registration Number, Number Plates etc. will be shared after execution. We recommend Printing and Mounting to be done by BMK to adhere to best quality standards suitable for the media & to avoid any sort of unnecessary inconvenience to the client. BMK needs to be intimated 20 days in advance if creative needs to be changed. The costing for change in creative including Printing & Mounting would be borne by the client itself. The creative design is needed in CDR format & high-resolution JPEG format. Maximum 20 days time would be needed for full execution of the campaign from the date the package is bought. In the case of the damage of the creative due to unavoidable circumstances, the same would be intimated to the client within 48 Hrs. 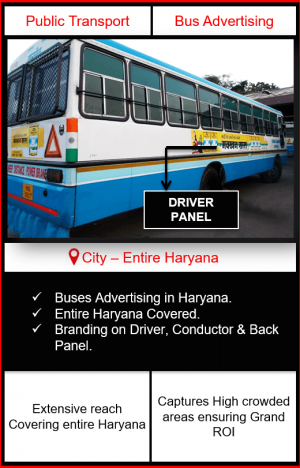 The exact dimensions of the display panels would be shared at the time of booking. 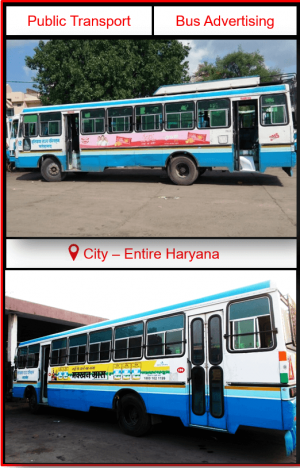 Public transport i.e. Public vehicle advertising ensures that each and every segment of the entire population is being covered. 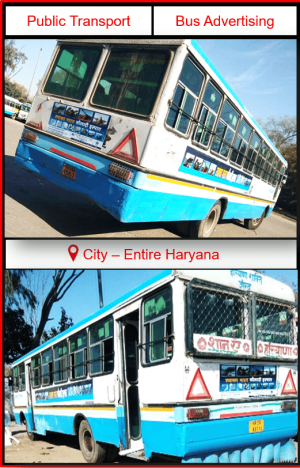 The vehicles in transit or on the move cover almost the entire area & even those restricted areas where Hoardings and Billboards are totally banned. 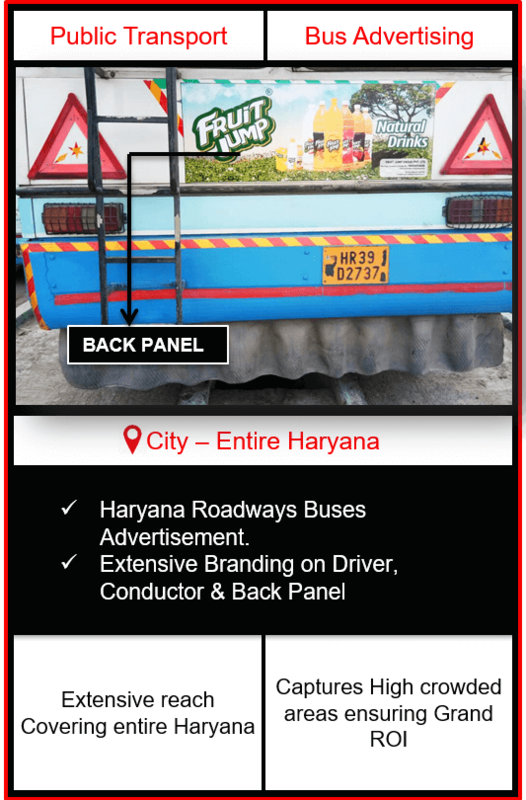 The public vehicle stands on the most crowded Place in the City which results in the unbeatable Branding Mileage for the Client even when the Vehicle is standing at one place. 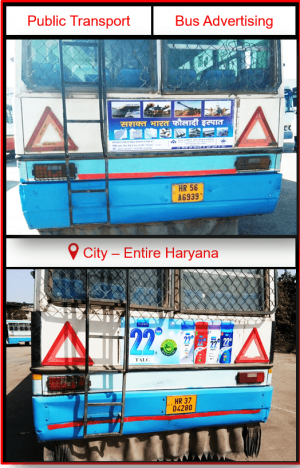 Among limited outdoor advertising mediums, where there is a clash of unavailability either in terms of excess rates or timing, these Mobile hoardings act as a boon to overcome all the hurdles. The medium creates an eye Catching impact on the viewers’ mind which consequently grabs the attention of massive road users. 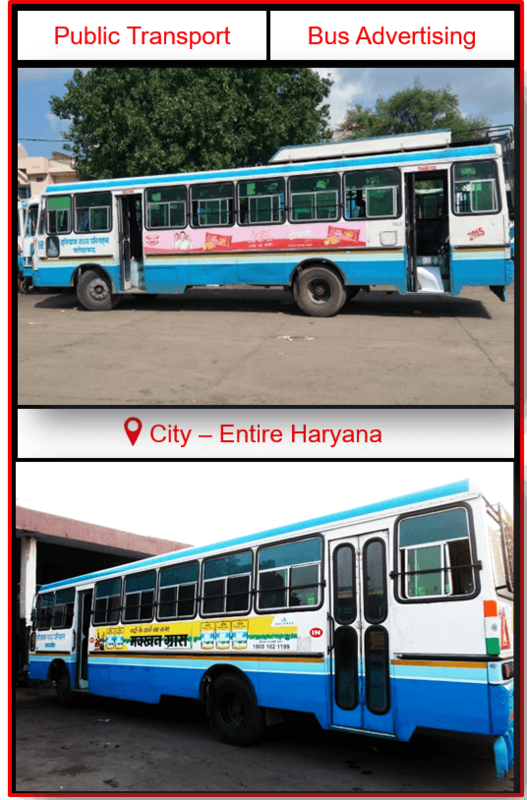 It ensures a Grand reach to the population by covering almost all the crowded places of the town. Quite flexible in terms of the duration of the campaign (Highly Recommended for long-term campaigns).